Looks like I Remembered everything on the boys' shopping list. Busy evening, so yes, there really is just ONE picture in this post and a grand total of four taken in the shoot. But don't worry, the boys got a full evening's pay for their Modeling efforts - which means almost all of the Cookies you see in that bowl split between them. Our Daily Challenge - April 25 2014 - "Remembered"
Daily Dog Challenge 907. 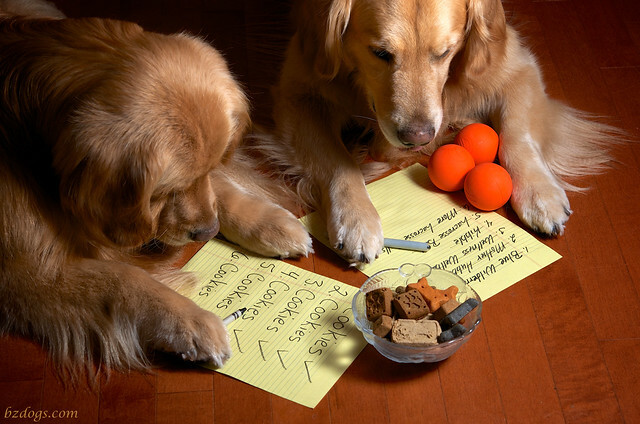 "Focused"
… as in they are very Focused on their lists. I think Zachary's attention might be Focused more on the Cookies. Hmmm… seems a bit empty down here without another picture.